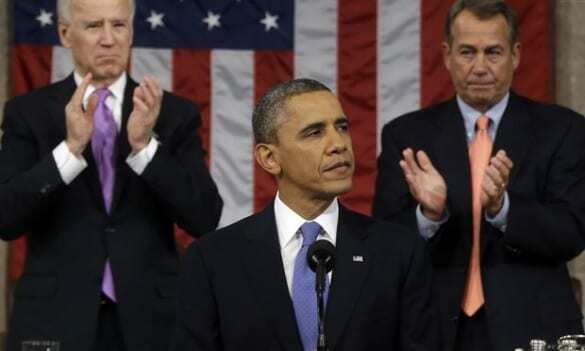 Compared to past President Obama’s past State of the Union addresses, this year’s was an unusual one for health care. The words “Affordable Care Act” weren’t spoken at all, and the only reference to the president’s signature law was a brief sentence mentioning the uninsured who gained coverage and the recent slowdown in the growth of healthcare costs. The omission of the ACA is especially odd considering that (1) so far the law has not just met, but exceeded its goals for expanding coverage and controlling costs; and (2) there’s another month left of open enrollment to buy coverage for 2015– something it seems like the president would want to mention. On the other hand, a bunch of other health care issues did come up in the speech, including a couple that we haven’t really talked about before on this site. Here’s our annual look at health care in the State of the Union. The president’s figure also leaves out the fact that millions more uninsured Americans would have coverage if every state adopted the ACA’s Medicaid expansion. 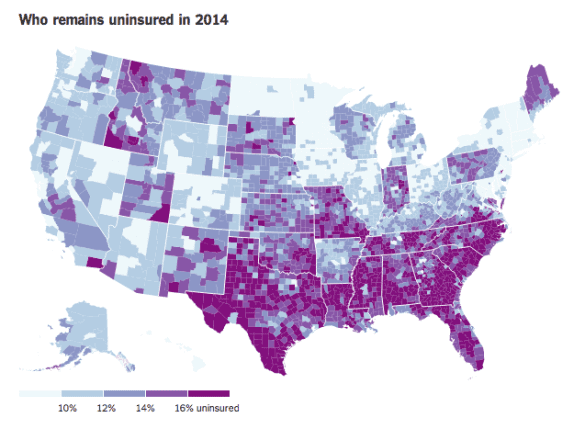 A fantastic map from The New York Times shows what percentage of each county in the U.S. remains uninsured: the states with the highest numbers of uninsured are in the south and midwest, along with Texas, Florida, Pennsylvania, Maine, Idaho, and Montana– all states that opted not to expand Medicaid in 2014. Pennsylvania is finally expanding its Medicaid program this year, but according to a study by the Kaiser Family Foundation, that still leaves nearly 4 million Americans who would be eligible in non-expansion states. We should point out that there is some debate about how much of the slowdown in health spending is a result of the Affordable Care Act,. 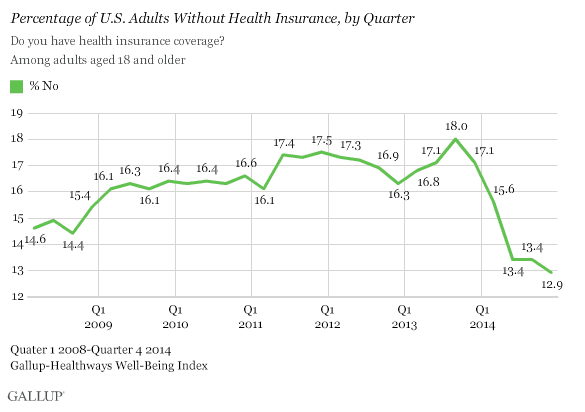 However, the president does not say here that the ACA is responsible for the slowdown. Critics claimed that health care prices would skyrocket as a result of the ACA– the president accurately points out that this has not happened. Technically it’s true that the U.S. is the only advanced country that doesn’t provide paid sick leave. But if you want to get nitpicky, the website Factcheck.org points out that Canada and Japan don’t offer paid sick leave for short-term illness (like, say a five-day flu)– they only cover pay for long-term illnesses (like, say 50 days of cancer treatments). 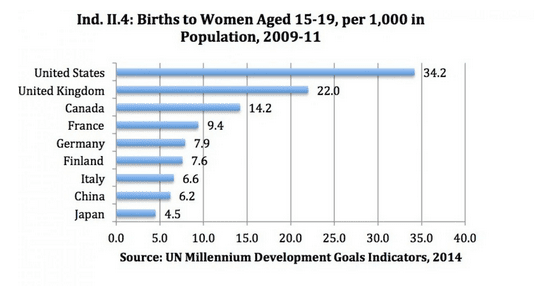 On the other hand, we really are the only developed country that doesn’t guarantee paid maternity leave. A 2014 report from the United Nation’s International Labour Organization found: “Only two out of 185 countries and territories currently provide no statutory cash benefits during maternity leave.” Those two countries are the United States and Papua New Guinea. Last Thursday, he signed a Presidential Memorandum giving federal employees access to at least six weeks of paid leave after the birth or adoption of a new child, or to care for an ill family member. He’s encouraging Congress to do the same for Congressional employees. California, New Jersey, and Rhode Island have already launched programs offering paid family and medical leave. The president’s 2015 budget proposal would encourage more states to join them, by providing $2.2 billion to cover “administrative costs and roughly half the cost of benefits” for up to five states for three years. The Department of Labor will also spend $1 million to provide grants for other states and municipalities who want to conduct feasibility studies. He’s asking Congress to pass the Healthy Families Act, which would allow workers to take up to seven paid sick days a year, either for themselves or to care for a family member. However, as Vox’s Danielle Kurtzenben points out, “That bill isn’t new — it has been introduced in every session of Congress since 2004.” In other words, don’t hold your breath on this one. Precision medicine (also called “personalized medicine”) refers to medical treatments based on the specific biology of individual patients. Examples include using genetic tests to determine whether you should take extra precautions for certain illnesses and experimental new drugs tailored to your DNA. The downside of these types of personalized treatments is that, at least for now, they’re extremely expensive and time-consuming to develop. If you’re interested in learning more, the website Vox has an excellent explainer on precision medicine here. Friedman notes there is more work to be done to get the number of cases to zero, but health officials sound much more confident than they did back in October. In a surprise announcement, the United States and China, which combine to produce nearly half of the world’s greenhouse gas emissions, struck a deal to reduce their emissions. The U.S., which has already pledged to reduce its emissions by 17 percent below 2005 levels by 2020, now promises to reduce them by 26 to 28 percent by 2025. China promises to cap its emissions by no later than 2030 and to produce one- fifth of its energy from zero-emissions sources by then. The worry now is that the deal isn’t legally binding, so there’s a chance either country could back out. Still, President Obama makes it clear in the the speech that he does intend to move forward on limiting emissions. 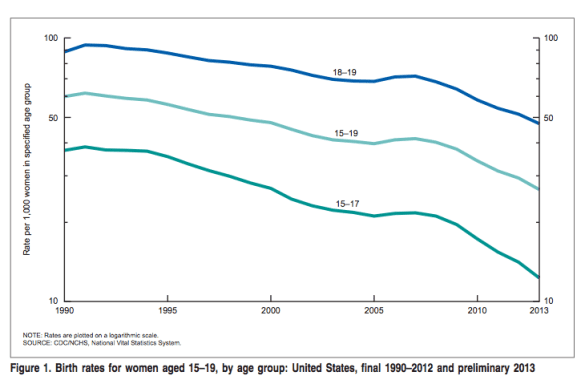 According to the CDC, 2013 (the most recent year we have statistics for) had “the lowest number of teen births ever reported for the United States”– 10% lower than 2012, and 57% lower than 1970, the peak year for teen births. 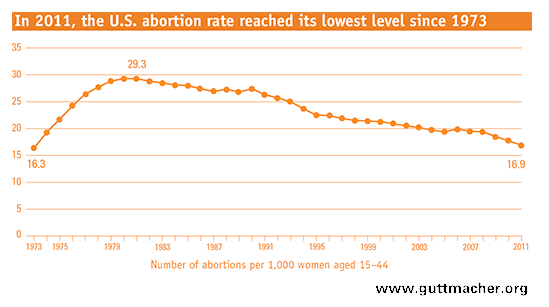 On abortion, President Obama is also correct: the Guttmacher Institute reports that in 2011 abortions were at their lowest level since 1973 (and we should note that 2011 was before many states passed new laws restricting access). And finally, as we’ve pointed out before, the Affordable Care Act contains many provisions specifically meant to improve healthcare for women. Next post: Republicans are changing how Congress calculates the cost of bills. Here’s why that matters.